Well, here we are again, another month has passed by and I’m searching through all of my beauty products to see what I’ve really enjoyed using the most throughout September. Can you believe that Summer has been and gone, and we’re now going into Autumn which I’m really looking forward to so much this year, it could be my new favourite season. My pumpkin candle has already been lit a couple of evenings this week and I’ve been eyeing up all the gorgeous new coats and knitwear that are in the shops right now. And I’ve even been making plans for Christmas, which is so organised for me it’s unreal! One thing I can’t bring myself to enjoy is a Pumpkin Spice Latte, yuk, it’s just too milky for my liking, no I’ll always be a cappuccino girl! 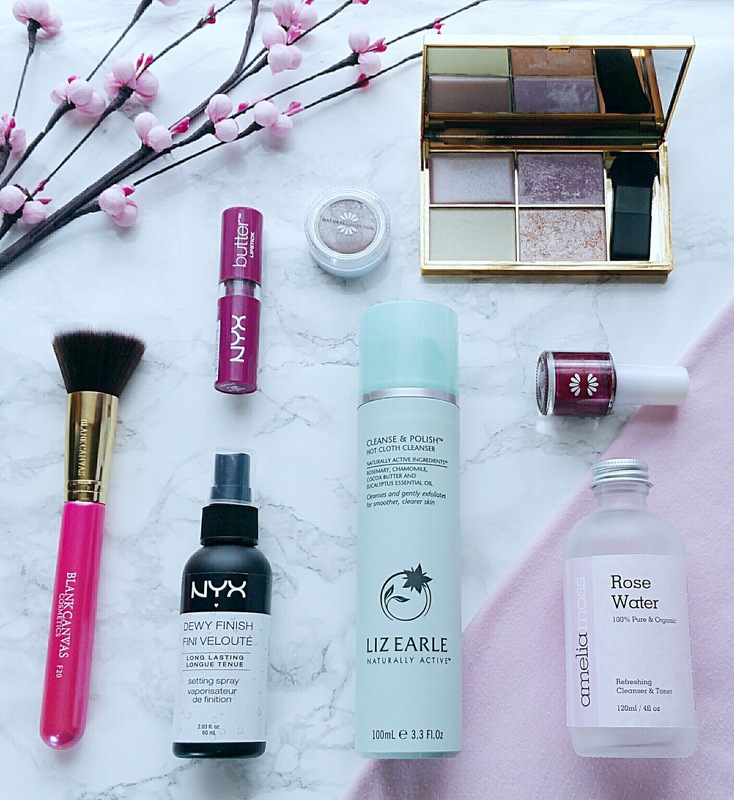 I have a lot of new additions this month so I’d better stop chatting and talk you through what’s made it into this month’s beauty favourites. This little beauty had been on my wishlist for what seemed like forever and I just hadn’t got round to buying it, but at the beginning of September I was extremely lucky enough to win one in a competition which was run by lovely Holly from Closing Winter. And wow, it is just amazing. 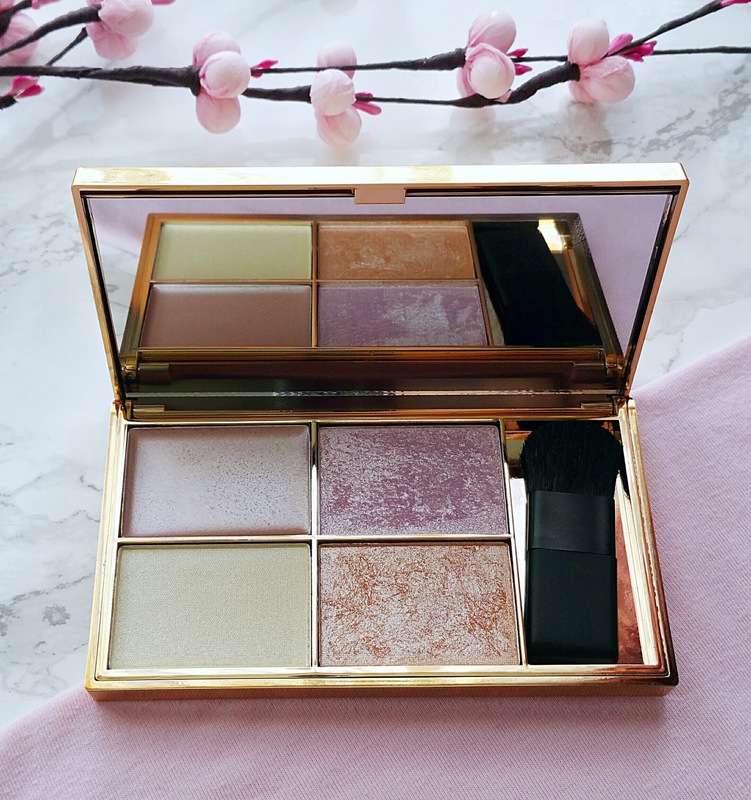 With 4 different highlighters all in one palette, three powder and one cream, it covers just about everything I need from some shimmer on my cheeks to adding a lift to my brow bone. The pigmentation is just incredible so you don’t need to use too much and I found it best to use my finger tip for the cream highlighter. I fell in love with this wonderful cleanser after buying the mini sample size in Boots, so before that one ran out I had to purchase the full size product and have been using it to cleanse my face ever since. It’s a gorgeous rich, creamy consistency and full of natural ingredients, it’s so gentle on my skin but still very effective at removing all of my make up. My complexion looks really radiant and my skin feels so soft. I’ve loved that my skin doesn’t feel all dry and tight after using this cleanser, but it still felt really clean. This is definitely going to be repurchased after I have finished using this bottle! This is the perfect addition to my Autumn make up bag as not only is it a gorgeous plum colour but I found it to be a cross between a lip balm and a lipstick, just right for the colder weather. My lips felt really soft and hydrated after using this lipstick. It has amazing staying power, I only had to reapply it once throughout the day which is pretty good for a moisturising lipstick. I also think it’s a great lipstick for everyday use as the colour isn’t too overpowering, plus it’s such a bargain for just £5.50! I realised that most of my nail polishes are summer shades, so I’d decided to pick up at least one new colour that was more Autumnal. Natural Collection is a brand I’ve only just recently discovered and if I’d have known the nail varnish was going to be this good I’d have picked up another shade at the time. At first I thought it may be quite fiddly to apply as it only has a short handle and a thin brush, but no, it was completely the opposite! The polish is super glossy with a slight glitter effect and this shade is just gorgeous. It dries really quickly and I do find I need to apply a couple of coats to get a solid colour, however the nail polish lasts for quite a few days, which is amazing considering they are only £1.99. I had a slight mishap with a beloved eyeshadow palette and my favourite shade is no more. I didn’t want to fork out for a whole new palette just for one eyeshadow, so while I was looking at the nail polishes I had a browse to see if I could find a single replacement. This single eyeshadow is the perfect one, it’s the prettiest khaki brown shade with a slight gold shimmer to it so it’s great for my everyday make up routine. The colour is buildable so I will start off going in light all over my eyelid and then add a bit more to the outer edges for a slightly deeper colour. I find this wonderful little pot of eyeshadow easy to apply and it blends in lovely for a really soft finish. The colour lasted all day but I do use a primer underneath as I would with all of my eyeshadows and this can really make a difference. 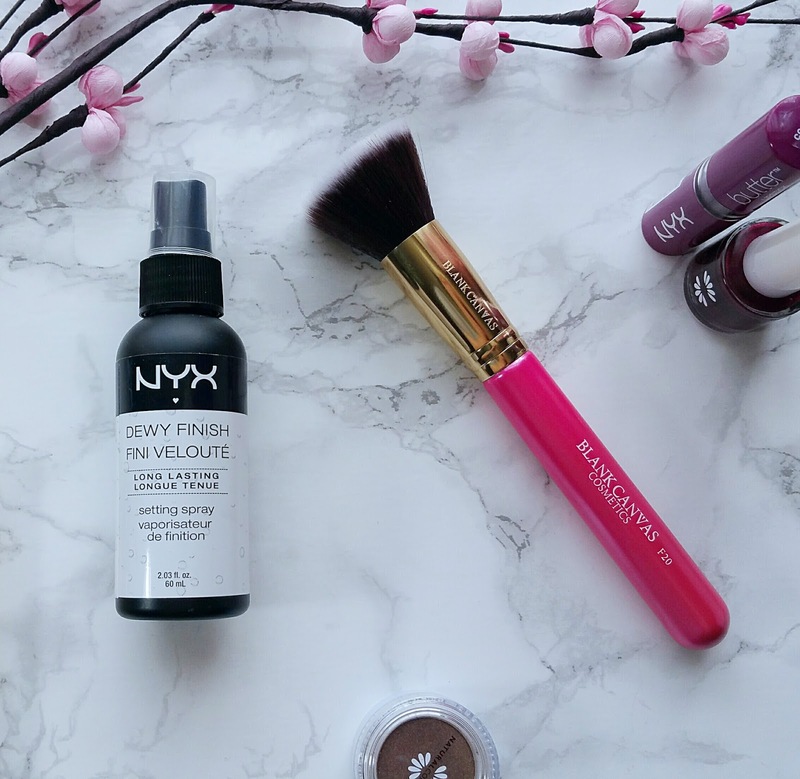 I was so happy when my local Boots started stocking the NYX make up range but I swear they need to move it’s position now as I’m becoming slightly addicted to it! Anyway, I was after a setting spray that wasn’t too powdery as they can be extra drying on my already dry skin. Honestly, this one is just amazing and keeps my make up looking fresh and dewy throughout the day. It’s lightweight and so comfortable to wear and gives my make up that little extra staying power so I don’t have to do any touch ups during the day. Fabulous! This one actually came with my July Glossy Box but I’ve been so impressed with it that of course it had to feature in my monthly favourites. The brush is super soft with short flat bristles making it easy to blend in my foundation and gives a really natural, flawless finish. I absolutely love it and it’s just the best foundation brush I have ever tried. I’ve been really enjoying using this gorgeous Rose Water toner as part of my skincare routine. It doesn’t leave my skin feeling stripped of all it’s natural oils and it’s so refreshing to use. I absolutely love the delicate rose fragrance which isn’t too overpowering. This is 100% natural and can be used as a cleanser as well. If you’d like to read my full review you’ll be able to find that here. What have your favourite beauty products been this month? Have you ever tried any of these? How did you get on with any you’ve tried? *Items have been sent for review but all opinions are my own. Quite a while ago I discovered that I really enjoyed shopping in Poundland, you can safely say I am slightly addicted to it. I find it’s a great place to pick really good blog props, branded beauty products, cute homeware pieces and even my basic stationery items. However, I’ve never been brave enough to try their own make up brand, Make Up Gallery apart from the odd nail varnish. Last month I was in Poundland stocking up on beauty basics, tissues and cotton wool, oh and I’d even picked up some sweet treats for a movie night, and there right near the tills was the Make Up Gallery stand. I actually went over because I’d been looking for a yellow nail varnish but sadly they didn’t have one, yet it got me thinking, would the other products in this £1 makeup range be any good? So here’s what I got. When I first tried these nail polishes I was pleasantly surprised at how good they were, plus there are so many gorgeous colours to choose from. This time I picked up the shades Candy Pink and Spearmint, both of which are beautiful pastel shades and mint isn’t normally a colour I’d go for. These nail polishes are so easy to apply with a large wide, flat brush and it makes the polish just glide on. I only needed to apply a couple of coats for a full coverage and a lovely glossy finish. The staying power is amazing especialy when I use them with my top coat. I’ll definitely be buying more of these! And of course my manicure kit wouldn’t complete without a few nail files? I picked up a pack of 6 pretty floral ones and they are just fine at keeping my nails in shape. Now I do love lip glosses and have no shortage of them but I wanted to see how this one compaired to other brands I have. Sadly I was a bit disappointed with this one. I picked up the shade Cranberry Crush, which at first glance is gorgeous but when I tried it on I had to apply about 4 coats to get any sort of colour on my lips, even though it was extremely glossy. It felt very sticky and didn’t last much more than an hour or two. Oh well, I’m sure my friend’s little girl will adore playing with this lip gloss. I wear a black liquid liner quite a lot of the time, but I am really rubbish at doing the flick. I’ve tried numerous brands, I’ve done the tape thing to get that perfect line but no, it’s just not happening. Until now. This amazing eyeliner has a very short brush which allows me to get a perfect application, it’s highly pigmented which I was so surprised about and it lasted nearly all day. Better still, it didn’t make my eyes sore! Now I’m not a great lover of powders but I do use a little to set my concealer or try and combat any shiny areas. The shade Honey Beige was perfect for me but as soon as I put my makeup brush onto the powder it sent a puff of product everywhere. I also had to keep applying it throughout the day, so maybe it’ll stay in my handbag for an emergency. I get on really well with makeup sponges for applying my foundation and I thought I’d give the Poundland ones a go. Do you know what, I’ve used the pink one a couple of times and it’s brilliant. I found it blended in my makeup nicely and didn’t leave me with any streaks, plus the sponge cleaned up really well. I’m not sure how many uses I will get out of these but they are almost as good as my Real Techniques ones and I’m forever loosing them. I also picked up some of the sponges on a stick, which look quite cute, although I have yet to put these to the test. Overall I’m quite impressed with the products from the Make Up Gallery range that I have tried and will definitely be buying the liquid eyeliner again. I’m itching to try out the eyeshadow and foundation now! And a couple of other things I picked up whilst in Poundland…. This smells divine! I wasn’t sure whether to lather it on my body or spread it on my toast. It smells just as yummy as Nutella. There was a choice of this one or a coconut and lime body butter and this fragrance won, being the chocoholic that I am. I’ve tested it a few times so far and it makes my skin feel so soft and smooth afterwards, it’s really thick and creamy and works wonders on really dry areas of my body such as my heels and elbows. I think this will be saved for my pamper nights as I really don’t want to go out of the house smelling of chocolate. well this is just a basic but I thought the bottle was quite cute. It’ll be perfect for those days when I can’t be bothered to wash my hair but need to damp it down a bit in order to use a styling spray or if I want to add a few drops of rose water and make up a facial spray to cool down if I’m feeling really hot. Well that brings me to the end of my latest beauty haul. Have you tried Poundland’s Make Up Gallery range? What did you think to it? I first starting looking after my skin a number of years ago now, but before that I’d just slap on the first thing I had to hand and didn’t really think about what I was putting on my skin or the effects it would have. I really want to keep looking after my skin and continue to have a good routine, using the right products for my skin type which is also really important to me. I’ve been looking more at what goes into a product and what benefits it will have on my skin so when Amelia Moss got in touch with me to talk about their 100% natural oils I was keen to learn more and they very kindly sent me their Jojoba Oil and Rose Water skin toner for me to try. All of their products are multi-purpose, you can use the oil as a cleanser, moisturiser and even work some through your hair to help combat dryness. I love this really simple, yet very effective, skincare routine from Amelia Moss. The brand has five different oils and they are all completely natural and 100% pure and organic, straight from the nut or plant, so you really know what you’re actually putting onto your skin, there aren’t any nasty surprises. First of all I’ll mention the beautiful rose fragrance, its so fresh and subtle, I didn’t find it too overpowering at all, but then I love the smell of roses anyway. 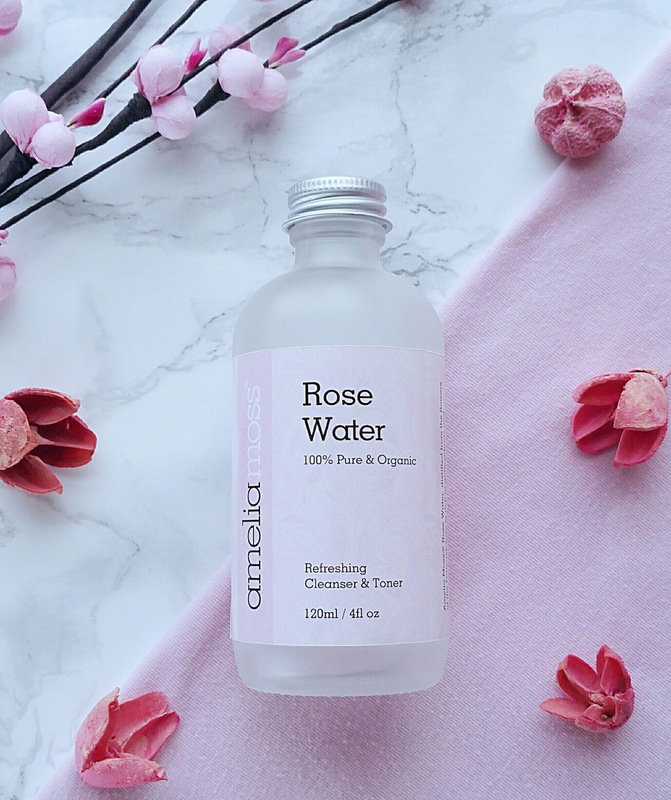 I’ve really enjoyed using this as part of my daily skincare routine and although the rose water can be used as a cleanser, I’ve been using it as a toner which is something I often skip in my daily routine. 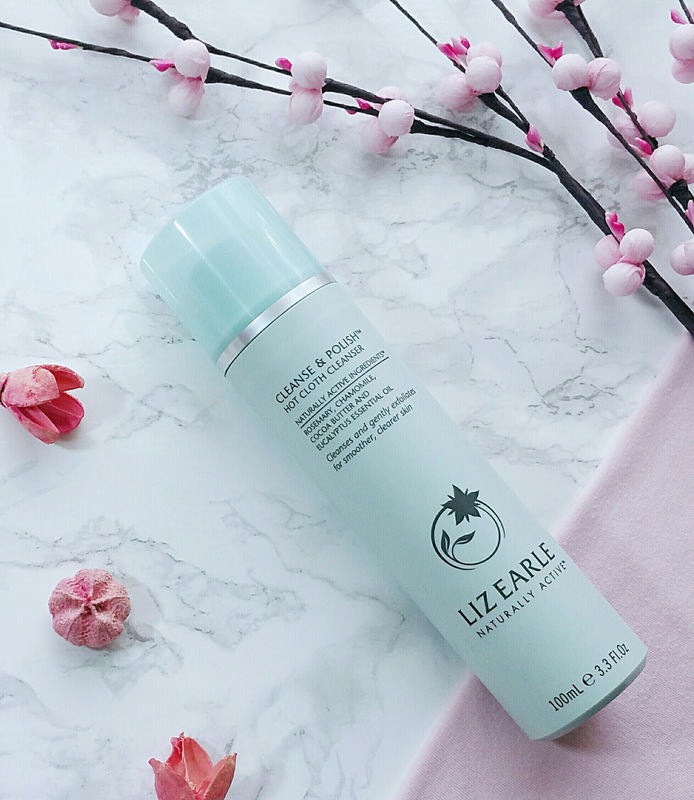 I apply a small amount to a cotton pad and gently wipe it across my face, honestly it’s so cooling and refreshing and it didn’t feel as though I’d had my skin stripped, which is what has happened when I’ve used some toners before. It works extremely well at making sure every last bit of makeup and cleanser has been removed and nothing is left behind. I feel as though my skin has been thoroughly cleansed and my pores aren’t left all clogged up. The Rose Water helps to maintain a healthy pH balance and contains anti-inflammatory properties, which my sensitive skin absolutely loved. Plus the beautiful glass bottle looks so pretty sitting on my dressing table! Jojoba Oil is produced from oil rich plant seeds and I’ve just loved incorporating this into part of my skincare routine. Again it can be used as a cleanser but I’ve chosen to use it as a skin treatment as Jojoba Oil mimics your skins own natural oils, so it really gets to work where it’s most needed which for me was on any dry patches across my cheeks and it doesn’t leave it too oily in other areas. After using the rose water I add a few drops of Jojoba Oil to my hands and gently massage into my skin. It leaves my skin looking plump and healthy and feeling amazingly soft and hydrated. The oil doesn’t take too long to absorb into my skin and there wasn’t any greasy residue left behind. It’s also helping to reduce a few fine lines which is absolutely brilliant. Jojoba Oil is packed full of vitamins and essential fatty acids and this powerful deep moisturiser is suitable for all skin types. It also helps to cleanse and soothe sensitive areas and give them a little extra special attention. I was also pleased to learn that Jojoba Oil provides the skin with a natural UV protection which is important for me even during the winter months. It felt a bit strange at first trying skincare on the ends of my hair, but I am so pleased with how it’s helped smooth the dry ends of my hair that I’ve been replacing my usual serum for this and my hair is looking a lot better. I’ve also been massaging in any that’s left on my hands afterwards! It can also be used as a shaving oil, which I have still got to put to the test. It truly is a great all round product to have! The Jojoba Oil comes in a dark bottle with a pipette applicator, making it easy to get just the right amount of oil you need to use. I’ve been using both the Jojoba Oil and the Rose Water for about a month now and I’ve absolutely loved using them as part of my skincare routine, especially at night as they really soothe my skin and both smell so relaxing, which is just what I need right before I go to bed. I think Amelia Moss will be a become a firm favourite of mine. So if you’re looking for a new skincare product to try, why not take a look at what Amelia Moss has to offer. Have you used Amelia Moss before? How did get on? I hope you’ve all had a wonderful month since my last monthly favourites post. Normally I’m sitting here writing how fast the month has flown by, but for me August seemed to have dragged on forever. It’s been a funny month with a real mix of emotions, there have been times when I’ve felt really happy and other times I’ve just felt really down after a few stressful things that have happened. On the whole though, things are going quite well at the moment and I’m hoping it stays that way. So I’ll get straight into talking you through my beauty and lifestyle favourites from August. I actually picked some of these up for a pamper parcel I’d made for a friend’s birthday and you know how it is, one for her and oh go on I’ll try one too. I think they’re wonderful. I just love the simplicity of these masks and how quick and easy they are to use, you just spread a thin layer all over the face, pop on some gentle music and relax. After about 15 minutes you carefully peel it off and wash off any residue. My skin felt amazingly soft and hydrated and was left looking radiant. They didn’t leave me all blotchy and I didn’t have a reaction which I am so pleased about. All of the ones I’ve used so far smell absolutely gorgeous too. This isn’t my normal anti-perspirant but it came in my July GlossyBox and it was even a full size bottle. I thought it might just be a gimiky thing but no, it actually works. I hate having to remember to shave under my arms when the weather is hot and I want to wear shorter sleeves. Well in just 4 weeks of using this anti-perspirant, I’ve noticed a huge difference in how often I’ve needed to shave under my arms and how much smoother they were. It doesn’t leave white flaky bits on your skin, which I can’t stand especially if I want to wear a dark coloured top. It has a lovely fresh floral smell and isn’t too over powering. Definitely a winner for me. Phew, that’s a mouthful to say, haha! A cheek product I’ve been loving this month is this little beauty from I Heart Make Up. Yes, I probably only bought it because of the cute pink heart packaging but the product itself is just adorable. This triple baked blusher has three shades all in one pot and when they are merged together using a makeup brush then applied to my face it gives the most gorgeous shimmer across my cheeks. It is highly pigmented so you really only need to use a small amount, not like some blushers I’ve had before where you’ve had to build up the product to get even a hint of colour. Thank goodness the product lasted all day and didn’t need touching up because the only downside to this product was that as it’s only in a cardboard pot it’s not very practical for carrying around in my handbag. This is a new one to my lipstick collection and isn’t it just gorgeous? The Rose Gold collection from Makeup Revelation comes in 5 different shades but this one is by far my favourite, it’s just adorable! It’s a bright bubble gum pink shade which I have worn practically non stop throughout August. It has a really creamy texture and makes my lips feels lovely and hydrated. The colour is buildable so you only need one coat for a slightly glossy look or for a more intense look you just add an extra layer of two. The colour has amazing staying power, even after I’ve had food or drink, so for me that’s brilliant. The packaging is super cute too, especially for only £3.00 as I was expecting them to be a lot more than that. It’s definitely a firm favourite in my makeup bag! I absolutely love this mascara and have been using it every day. It gives me a natural daytime look and still makes my lashes look long and defined. I found the brush super easy to use which just glides on and it gave my lashes a slight curl and enough volume without looking clumpy. I also love the pink packaging! A real bargain for only £2.99! This brush is perfect for brushing through my long hair when it’s either wet or dry and without snagging and causing any breakage. It’s ergonomically shaped so it fit comfortably in the palm of my hand and is so easy to use. I love how it is so gentle on my hair and it’s small enough that I’ve been able to carry it in my handbag every day in case I’ve needed to give my hair a quick tidy up. I’d always dismissed the idea of meditation and self help books before but this book is nothing like I’ve come across in the past. It’s all about learning how to de-stress and calm down with a busy, stressful lifestyle. The book is divided into eight sections, each one has creative prompts and activities, along with loads of inspiration for a calmer life. It’s one of those books you can dip in and out of and find which bits work best for you. It’s designed to work with the app which I’ve downloaded onto my phone and I’ve been working through the meditation sections on Calm and Anxiety Release. I listen to it when I’m travelling or after a particularly stressful day, I’ve also been listening to the one for sleep just before I go to bed which has really helped me to get rid of all those vent up feelings and made me feel a lot calmer. Even if you didn’t want to purchase the book, I’d definitely recommend downloading the app and giving it a go. Well that’s it for this month. Thank you so much for reading. What have you been loving this month? Have you ever tried meditation? I’m slightly obssessed with beauty products and when something as gorgeous as my monthly Glossybox arrives in the post I do tend to get a little bit excited. Normally I’d tear straight into the box without even thinking about photos or a blog post as I’m way too impatient and can’t wait to see what’s inside. 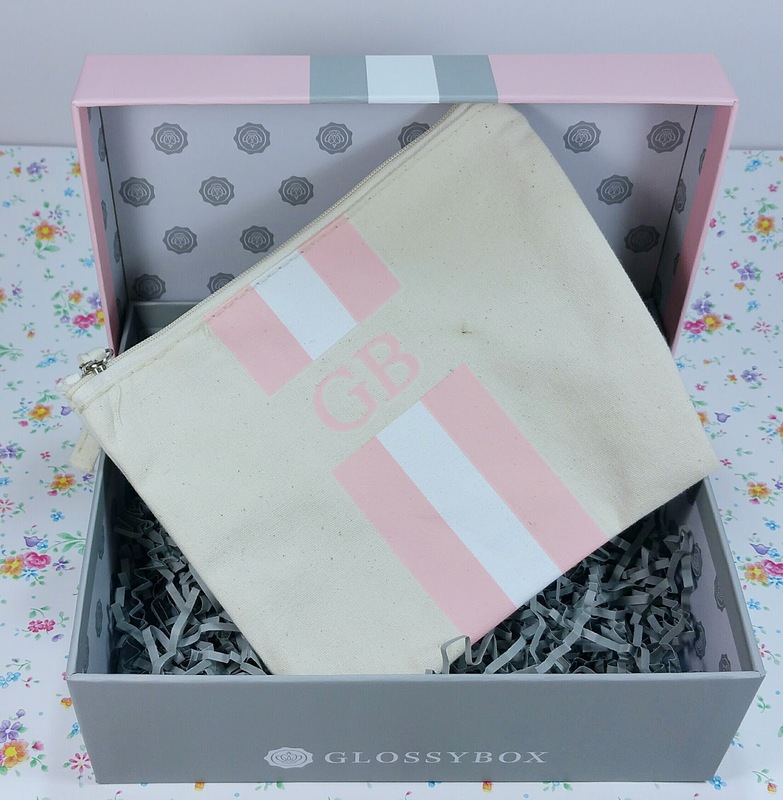 So I thought that this month I’d share my first unboxing post with you and let you have a sneaky peak of what came in the August Glossybox (sorry – Spoiler Alert!!). It’s Glossybox’s 5th birthday and to celebrate this month they’ve joined up with the luxury accessory label Rae Feather to give subcribers a special collectors edition, including an accessory exclusively designed by the brand, and the packaging is definitely different to their usual pink and black style. So let’s see what’s inside. 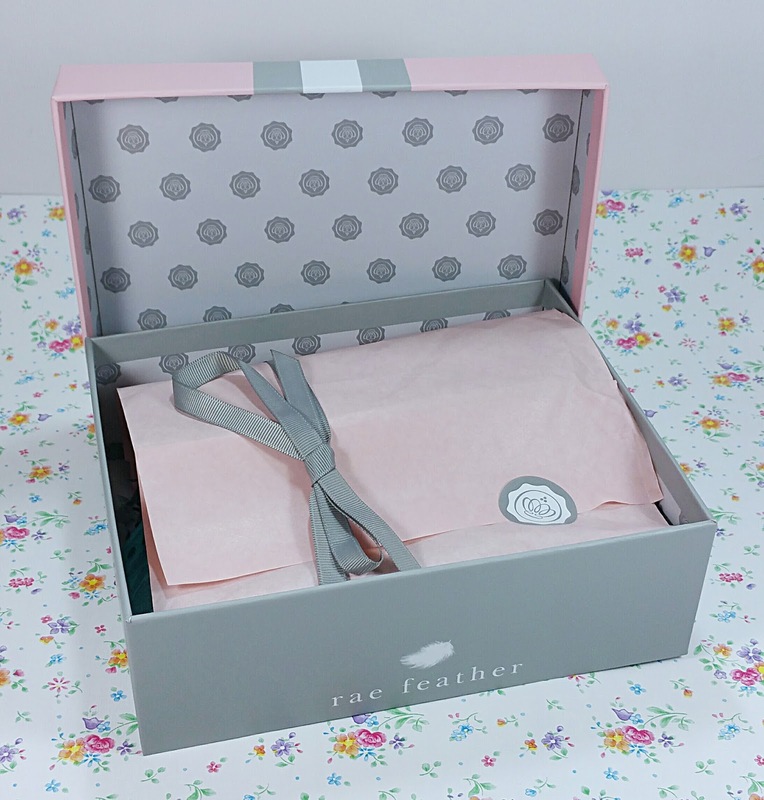 Firstly, can I just say how adorable the pink and grey packaging is on this month’s box. The contents always come wrapped up in pink tissue paper with a cute little bow and I feel like it’s Christmas every time I open one as I never know what’s going to be inside. Can you sense the excitement here? There will be a mix of travel or full size beauty products and I just can’t wait to start trying everything out. 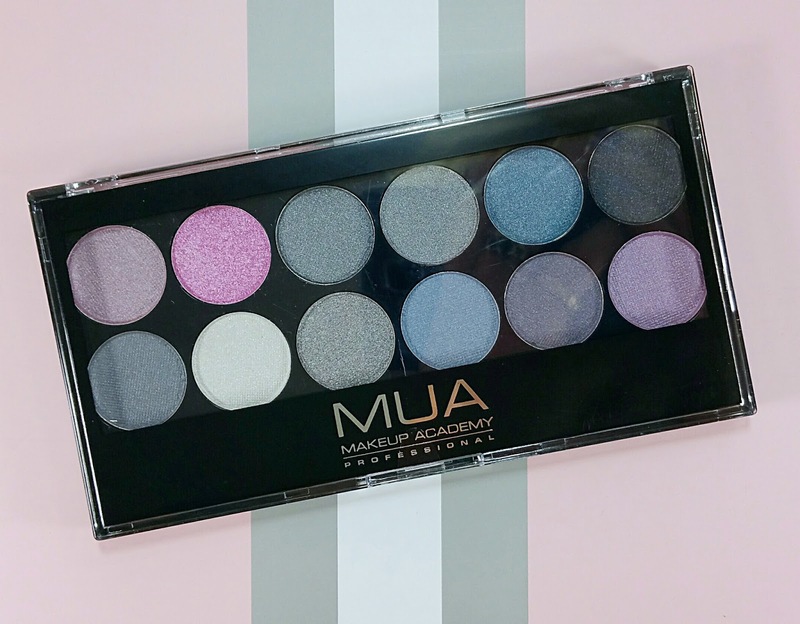 Last month subscribers got the chance to almost personalise their box by choosing an eyeshadow palette out of a choice of four from MUA’s bestsellers. I decided not to as I wanted it to be as much of a surprise as the rest of the products in the box. I was sent the MUA Starry Night palette which is a mix of greys, purples and blues and I’m really pleased with this one as not only do the colours look gorgeous but it’s a brand I’ve never tried before so it’ll be interesting to see how this shapes up to my other eyeshadow palettes. 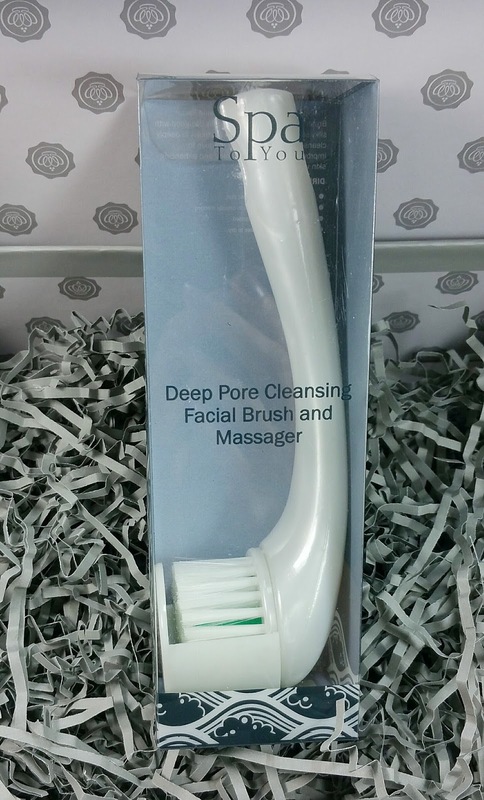 Ooh, lovely, a Spa To You Deep Pore Cleansing Brush. I’m used to using a manual cleansing brush already, no I still haven’t got an electric one! They are designed to work with your cleanser and gently buff away dead skin cells without over exfoliating. The bristles on this brush seem really soft so I’m looking forward to using it as part of my skincare routine. Next there is a Mudmasky Facial Detox Purifying Recovery Mask which I’m really pleased about as I’m all about skincare at the moment. Every week I love to use a facemask to boost some life back into my complextion. This one is a PH balanced facial treatment, which is something I don’t normally bother to look at and maybe I should. It uses all natural ingredients so this mask should be gentle enough for my sensitive skin and I’m not sure I can wait until my Sunday night pamper session to give this one a try. 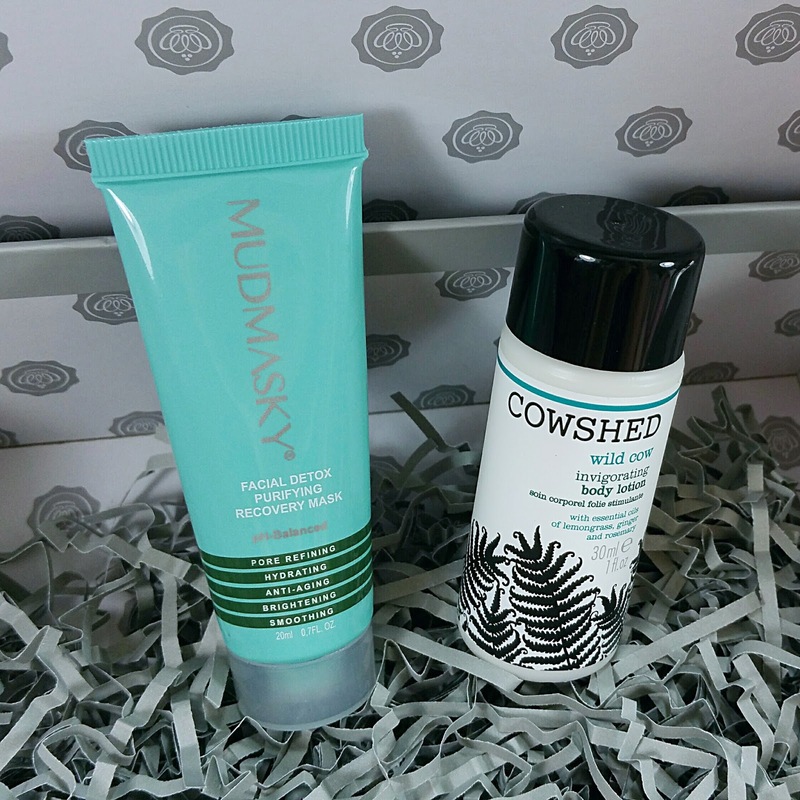 I am over the moon to have received Cowshed Wild Cow Invigorating Body Lotion in this month’s box. I’ve seen this mentioned loads of times but again it’s a brand I’ve not tried before. The size of this bottle is just perfect for travelling and also a great way for me to try the actual product before going and spending out on a full size one. First impressions, well it smells absolutely divine with a blend of lemongrass, ginger and rosemary which will certainly give my senses a buzz in the morning. Its a really thick body lotion that just glides onto my skin and my arm felt so soft afterwards. It deeply moisturises using Shea and Cocoa butter and again it’s made with natural ingredients and full of essential oils. I think I’m really going to love using this body lotion. The final item is this mini monogrammed straw pochette which has been exclusively designed by Rae Feather. It’s such a cute design and the size is going to be just about right to carry a few daily essentials in my smaller handbags. The one thing I was disappointed about was that when I took it out of the box there was a black mark on the front right hand side. I’m sure I will be able to get it out, but sadly it’s not what I’d have expected from a brand new item. Overall I am really pleased with the mix of products in this months box and I’m really looking forward to trying out all of these amazing discoveries. 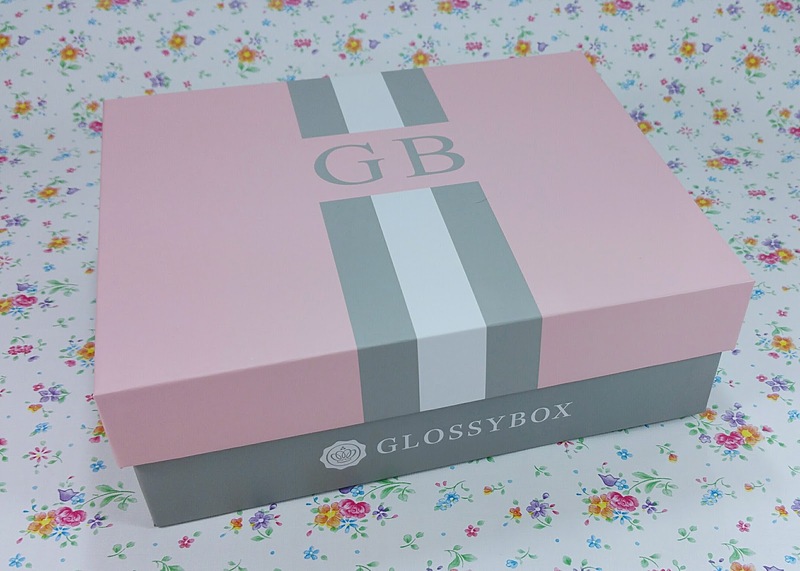 Glossybox costs £10 (plus P&P) for a monthly subscription which you can cancel at anytime or even just have it as a one off box, which I think is really good value as the contents of this months box is worth over £50. They also offer 3, 6 and 12 month plans. Thanks so much for reading. Have you tried a subscription box? Which ones are your favourite? 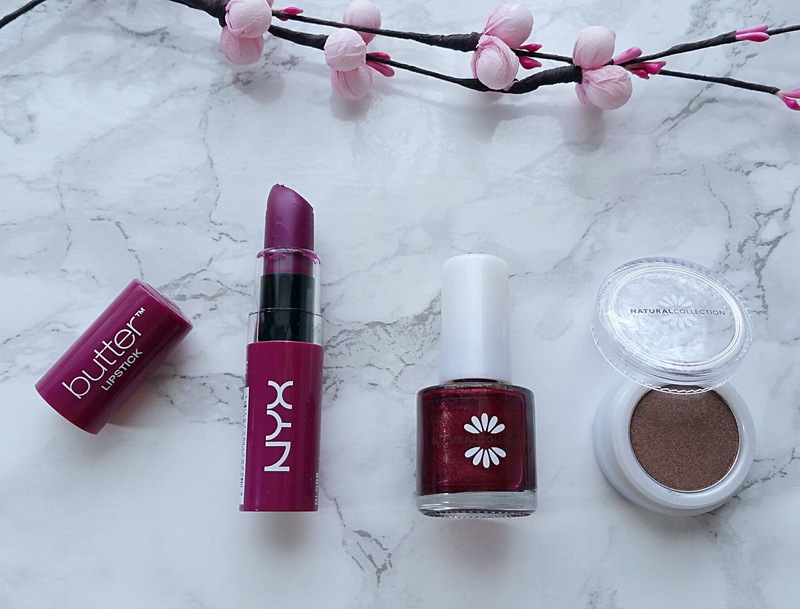 You may also like to read my Monthly Favourites post.